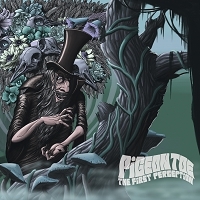 You should consult your doctor, when having questions about “Pigeon Toe”, but in this review it's all about a quintet from South of Germany, that has created a progressive metal band under this unusual and very strange banner. So I'll play your doctor today and give you my expertly advice. The idea of the “toes” was sown as a side project to ‘Fear My Thoughts’, ‘Backslide’ and ‘Mongouse’ in 2008 by the brothers Hanson and Marsn, both guys delivering the guitar rhythms and riffs on this new release. The line-up was completed when Norman Lonhard (Triptykon) on drums, Patrick Hagmann (ex-Fear My Thoughts) on guitar & synths, and Ben Krahl (Final Kings) on bass, decided to join the brothers of “toes”. After two years of touring ‘Pigeon Toe’ is finally ready to unleash this debut release, entitled ‘The First Perception’, to the crowd through their label company Lifeforce Records, and it includes 11 tracks spinning almost 50 minutes of prog metal. Germany is already known for its contribution of high quality bands to the progressive scene with bands such as ‘Vanden Plas’, ‘Dreamscape’ and the newcomers ‘Beyond the Bridge’. Will ‘Pigeon Toe’ be able to distinguish themselves among these? Two things glues to my mind upon the first run, the vocals and the production. The vocals are handled by 3 members of the group, the brothers on guitar and the bassist. None of them are able to add any remarkable vocal performance to pep up the cocktail. My ears and heart are missing soaring and versatile vox and it’s only unique, when the extreme vocal is in front. It’s not all bad though. They are definitely talented musicians, which are heard, when their fingers do the talking on the strings, with beautiful layered guitar solos and odd time signatures on top of the complex song structures on this release. Put in a very good production with “roots” from the 70s music scene and its heavy influences by prog death metal maestros Mikael & Co. from Opeth, and it is sounding amazing. It’s a very mellow and melancholic universe beautifully illustrated by the musicians, but still I’m missing variety in the songs and how they are performed both vocally and instrumentally. To fix this broken “toe” I would suggest them go hunting for a new lead singer, not saying they need to pick him up at the nearest opera house, but a singer with a more versatile vocal and a more dynamic range is highly appreciated. Mikael Åkerfeldt from Opeth is a good choice, known for his angel voice and death growls. His pipes would perfectly fit the melodic, groovy and mellow soundscape presented on this album. The only unique thing about this band, that hits my “metal mind”, is the name of the band. With all the prog bands out there today, they really have to bring something new to the prog metal scene other than a pretty bad sounding name. Sorry guys, I’m still not convinced after spinning this album uncountable times, but If you like Opeth, I would recommend you to check this one out and just “mute” the vocals.